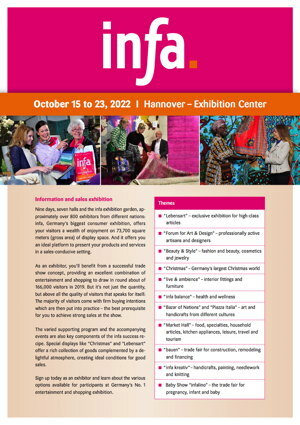 Nine days, eight halls, 1,400 exhibitors from 40 different nations: infa, Germany’s biggest consumer exhibition, offers your visitors a wealth of enjoyment on 100,000 square meters of display space. And it offers you an ideal platform to present your products and services in a sales-conducive setting. As an exhibitor, you’ll benefit from a successful trade show concept, providing an excellent combination of entertainment and shopping to draw in round about of 183,000 visitors. But it’s not just the quantity, but above all the quality of visitors that speaks for itself: The majority of visitors come with firm buying intentions which are then put into practice – the best prerequisite for you to achieve strong sales at the show. Sign up today as an exhibitor at the 65th infa and learn about the various options available for participants at Germany’s No. 1 entertainment and shopping exhibition.